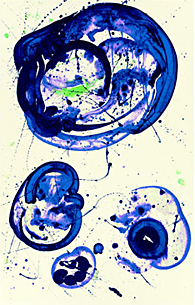 1958, oil on canvas, 9'x 10'6"
"Bright Jade Ghost, Variant I"
Sam Francis, American painter, b. San Mateo, California, 1923. After studying medicine and psychology at Berkeley, California, Francis served in the Air Force from 1943 to 1945. 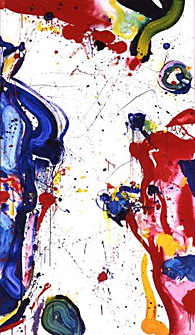 When he was in hospital recovering from wounds, he became interested in painting, encouraged by a friend, David Parks, a teacher at the School of Fine Arts in San Francisco, and exhibited there for the first time in 1948. In 1950 he went to Paris, where he lived for a long time, with frequent stays in New York and California and journeys round the world from 1957 to 1959. These took him to Mexico, India, Siam, Hong Kong and Japan, where he stayed several times to work. He returned to the United States in 1961 and settled at Santa Monica, California, in 1962. 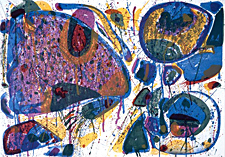 Francis has had many successful exhibitions: in New York (1956, Martha Jackson Gallery); in London (1957, Gimpel Fils Gallery); in Tokyo and Osaka; in Dusseldorf (1959, Kunsthalle); and in Switzerland, where in 1956 he created an important mural triptych for the Kunsthalle in Basel, before the Kunsthalle in Bern gave him a large one-man show in 1960. It was in Paris, however, that he made him reputation; in 1952 the Galerie Nina Dausset put on his first exhibition, and others soon followed at the Galerie Rive Droite, in 1955 and 1956 the latter under the aegis of Michel Tapié who, in Un art autre, had already set Sam Francis among the significants de l'informel, to which he brought, after Pollock, a new special dimension on the American scale. It is in fact the sense of space, as a place into which light is poured, that conditions the tachiste expression of Francis, who himself has said that "space is color" and thus recognizes the importance of the example of Monet and Matisse. Working on a very large scale in broad, vigorous patches of color, light or dark, he modulates the surface to create moving spaces impregnated with an intense life. 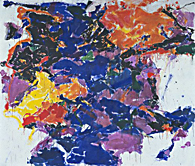 In his "blues" (1967-8) he progressively extended the space separating the patches of color, pushing the color out toward the edges of the canvas in order to emphasize the "open form" of the white field. His works are found in many American galleries (notably in New York, M.O.M.A. and Guggenheim Museum), as well as in London (Tate Gallery), Paris (M.N.A.M.) and Zurich (Kunsthaus).